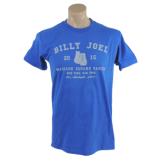 You can buy the latest, official, one-of-a-kind merchandise at the Official Billy Joel Store. Click title or photo. (This website One Final Serenade is not affiliated with or endorsed by Billy Joel or Sony Music Entertainment). Buy music (CDs and MP3s), DVDs, and other merchandise and media at this store on Amazon.com, or via banner below. Buy Billy Joel music, videos, and eBooks on iTunes. DISCLAIMER: This site is an unofficial fan site that is not affiliated, endorsed, or sponsored by Billy Joel, Sony Music or Columbia Records, Maritime Music, or any similar entity. All music and lyrics by Billy Joel are copyright by Joel Songs, Sony Music, or various affiliated organizations, and are provided here for research and references purposes, and commentary. To visit the Official Billy Joel website, click here. Otherwise, other text and layout are copyright this website, One Final Serenade.